Using Learning A-Z, A Guided Reading Gold Mine! It wasn't until recently that I discovered my new favorite website, Learning A-Z. I had first heard about this website from a colleague at the beginning of the school year last year. She had mentioned that she used Reading A-Z (a product of Learning A-Z) to complete her beginning of the year assessments and for her guided reading resources. I have to be honest, I initially shrugged it off as another website with a plethora of resources that are generic and partially resourceful. Boy, was I WRONG. I can't believe that I missed out on all that this website had to offer for a full school year! Once I realized how much was on the website, I could've screamed. I was told about this website in September 2014.... fast forward to May 2015. I was looking for resources to use during the reading clinic I was running last summer. I stumbled upon the Learning A-Z website and started to click through it, they have a total of seven products for literacy: Reading A-Z, RAZ Kids, Headsprout, Science A-Z, Writing A-Z, Vocabulary A-Z, and ReadyTest A-Z. Even though these are all member sites, there was a good amount of information available to read before making any kind of commitment. Most importantly, you can get a 14 day free trial to really get a good look at the variety of resources they have available. I already knew before I took the free trial that I was going to purchase a Reading A-Z membership but after test-driving RAZ Kids, I decided to buy a membership for that as well. Each membership cost me $99 for a year each. Reading A-Z has every single thing you need for implementing guided reading successfully in your classroom. Guided reading, an integral part of your balanced literacy program, is defined by Fountas and Pinnell (2002) as a teaching approach designed to help readers build an effective system for processing a variety of increasingly challenging texts over time. The first step in planning for guided reading is to first determine the reading levels of your students. Reading A-Z has a bank of benchmark passages and books that can be used as running records when leveling your students. They have assessment resources that can be used to level a student from A-Z. They also have a correlation chart that translates students' levels using a variety of assessments (DRA, Lexile, Fountas and Pinnell, and more). Once you have your students' levels, Reading A-Z has a (very large) bank of leveled books that can be used from levels A-Z. They provide you with a printable book, a guided reading lesson with a common core supplement, highlighted vocabulary, reading strategy activity sheets, discussion questions, and phonics activity sheets. Reading A-Z also provides assessment activities with each leveled book to help you collect data on each of your students. There are over 20 books for each level, giving teachers a great deal of materials that can be used during guided reading. These books can also be read on a tablet and/or projected onto the white board. The most difficult resource to access when trying to do guided reading in your classroom effectively is a strong collection of books. Reading A-Z has a wide variety of books for every level making this aspect of guided reading much easier to accommodate. Reading A-Z offers themed books: biographies, fables, fairytales, folktales, how to's, interviews, legends, mysteries, and more. They also offer decodable books, vocabulary books, poetry books, comic books, and list goes on. Basically, they have everything you need for key reading skills (fluency, vocabulary, comprehension, and writing). Reading A-Z also has a wide variety of resources for building foundational skills. Just click here to read more about the resources this website has to offer: Reading A-Z. RAZ Kids is another member site that I subscribed to during the summer. I purchased this resource primarily because it provides students with a large collection library of books. With your membership you can add up to about 30 students to your class list. When you add your students, you note their reading level. This gives students access to a selection of books on their level. Students can access this site via the web or they can download the RAZ Kids app. Once inside the site, students can read or listen to books. They can also answer questions about the story. When on the computer students can record their readings. You get to monitor student logins, books read, you can listen to their readings, and you can see how they perform on the short assessments after they read. Students can no longer tell you they don't have any books to read at home AND you can make sure they are reading appropriate books during their independent reading time. I started my membership to these two sites in June. I used them with the students I tutored over the summer and will be using them with my students this school year. There are so many resources on the Reading A-Z website that I haven't had a chance to see everything yet! I look forward to seeing all of the ways these resource will benefit my students. 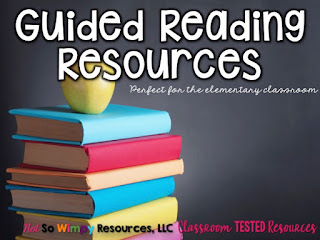 If you are looking for meaningful and effective resources for guided reading, this is definitely a site worth checking out! Wishing you an awesome school year! !